Affordable, comfortable, and sporty: All three of these adjectives can be applied to the 2019 Audi A3. And, as Audi fans will already know, you should expect nothing less from this superstar German automaker. But what precisely makes this year's line-up so special? Are there any downsides to buying this sedan? Let us take a more in-depth look at why you should buy the A3 and a few reasons that might cause you to re-think getting it. Audi seems to love making appropriate changes to their vehicles. The 2019 Audi A3 reflects this, as it gets standard smartphone app integration with Apple CarPlay and Android Auto. Also, the Sport Package has been eliminated for the model year, and the Premium Plus now comes with a standard wireless charging pad and LED headlights. The most obvious reason that people will want to purchase the 2019 Audi A3 is the base trim's affordable price tag. Starting at the lower end of $30k, the Audi A3 does have a competitive MSRP that gives it an edge over other luxury sedans. Of course, the higher up you go in trim levels, the more expensive the car will become. Still, it is one of the more reasonably-priced models out there, and it proves to be a good deal with how many features come standard. If you end up going for the base trim, you will probably want to equip the Convenience Package. 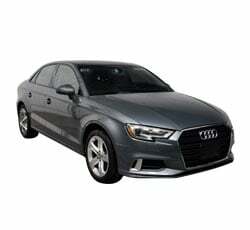 This package includes features like keyless engine start and stop, LED lighting for the interior, window surrounds formed in high-gloss aluminum, and Audi side assist. The package doesn't pack too much bigger of a price tag on to the vehicle, and the features that included are really nice to have. It will save you from spending more money on a higher trim level just to get these features as standard. The 2019 Audi A3 is a remarkably quick little sedan. It can go from 0 to 60 mph in just under 6 seconds thanks to its turbocharged 4-cylinder engine. There is only a small moment of hesitation right at the beginning, but once you get past it, everything is smooth sailing. Also, the all-wheel drive versions have impeccable road grip, which is helpful for speeding up and slowing down. Speaking of the Audi A3's brakes, they are strong and feel secure. You can make a panic stop from 60 mph in just about 118 feet, which is pretty short for this segment. (Of course, the Audi A4's 99 feet is even more mind-blowing.) This just goes to show how much thought Audi has put into making their vehicles secure and in giving their drivers peace of mind. Steering also has a precise feeling on the 2019 Audi A3. It is controlled and effortless under all circumstances, but it does give the driver just the right amount of feedback from the road. You can take this little luxury sedan on steep and winding roadways and still feel secure behind the wheel. No matter how you drive it or what road surface you take it on, the Audi A3 definitely inspires confidence. To make the driving performance all the more engaging, Audi has given the A3 some seriously impressive handling capabilities. As we already mentioned, the all-wheel drive system keeps a solid grip on the road surface throughout all kinds of maneuvers. The vehicle itself has a sporty and light feeling while rounding through curves. The suspension is well-tuned, creating a strong sense of balance and sturdiness for the vehicle. Overall, the driving performance is well-rounded and exciting. While you will enjoy the spunky nature of the driving performance, the 2019 Audi A3 has a wonderfully comfortable ride quality. While some larger bumps in the road will cause a little bit of a tussle, the ride is otherwise very compliant and smooth. The comfort is only added to with the spacious and well-cushioned front seats. Riding for hours can actually be delightful in this sedan. A lot of automakers are still working to perfect their infotainment technology and make features easy for all types of drivers to use. Audi, however, has it pretty well nailed down. The infotainment system has crystal clear graphics, and the buttons that appear on the touchscreen display are set up in a logical, easy-to-follow order. Everything feels intuitive, and there are enough physical controls for non-tech-savvy drivers to feel comfortable with the A3's technology. Visibility is excellent from both the front and rear of the 2019 Audi A3. The slender roof pillars contribute immensely to this, so much so that you really do not even need to rely on the standard rearview camera for assistance while backing up. Of course, it is a nice feature to have, but you will not likely find yourself depending on it. Getting the blind spot monitoring system adds the benefit of knowing when a vehicle is approaching your car's blind spots, but even those are pretty small. Audi spares no expense on the cabin of the A3. All of the materials look and feel like they are made from only the best of materials. All of the controls have some bulk to them, so they do not feel like cheap little plastic pieces that could break off or crack under pressure. The upholstery is lush and lovely to look at, as is the interior trim that complements it. You will feel like you are riding around in luxury. The biggest drawback on the 2019 Audi A3? It has a tiny rear seat. Granted, this is already a small sedan, but there are other vehicles in its class that are designed with more head, hip, knee, and leg space in the back. Taller adults will definitely feel crammed in, and you will not have a ton of extra space for things like groceries or luggage. Unfortunately, one of the problems with having such a small rear seat is that this creates difficulties while getting in and out of the vehicle. Taller adults will have to duck down low and twist themselves in order to get in. Bonking of the head is a potential hazard here. Thankfully, those riding up front will not have such a headache since the front driver and passenger doors are given a taller design. With a small rear seat, you would hope that at least the cargo area would be somewhat sizable. It is not. The 2019 Audi A3 only has 9.9 cubic feet of cargo space available with all seats in place. This can be maxed out to 12.3 cubic feet when you fold the rear seats down, but even this does very little to help the A3's case. Too many of its competitors have bigger cargo areas and back seats. Although this is merely a minor gripe, the engine does give off a little bit of a grumble once you have started it up. It will die down fairly quickly, but it is noticeable for a few moments. Other than that, expect a nice, quiet ride. The 2019 Audi A3 faces stiff competition from the 2019 Cadillac ATS. The ATS has an optional manual transmission, which you won't find in many small luxury sedans. Also, it has excellent handling and steering. On the downside, the ATS has a noisy and fuel-hungry turbo-charged 4-cylinder engine. Another top rival for the Audi A3 this year is the 2019 BMW 2 Series. The 2 Series is always sure to sell fairly well due to its affordable price tag, good fuel economy, and inclusion of numerous standard features. This year, a lot of advanced safety features (including sensors for the front and rear of the vehicle) have been standardized. However, like the A3, the 2 Series also suffers from a cramped rear seat. It does have more space in the trunk than the Audi A3 though, which gives the 2 Series a bit of an edge over the competition. The 2019 Audi A3 is by no means the most spacious vehicle in its class, although small luxury sedans tend to be pretty limited on space as it goes. The lack of space is made up for by the A3's powerful driving performance and long list of standard features. While it might not be everyone's cup of tea, a lot of drivers will find themselves attracted to the luxury it offers for a fraction of the price of what other automakers charge. Overall, it makes for a relatively good deal.